Some authors just work better on audio. Sarah Vowell, like David Sedaris, is, for me, one of those authors. When I read them in print, because I know they’re meant to be funny, I find myself reading for punch lines, but their humor is so deadpan that it’s not really about punch lines, and my internal comedy reading voice just doesn’t work. I am, however, an ardent fan of the radio show This American Life, and Sarah Vowell’s essays are part of the reason why. So, of course, I figured I’d be entertained by an audiobook of nothing but Vowell. And I was. 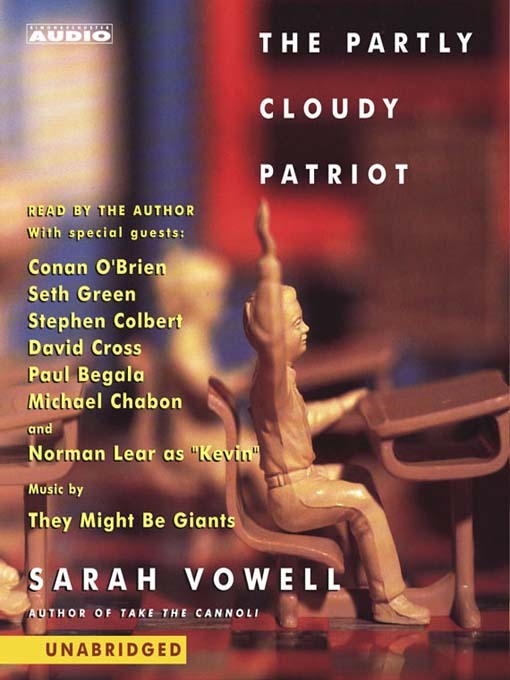 The Partly Cloudy Patriot is a collection of essays by Sarah Vowell. Most of these are musings on American history and politics, although she also writes about her family, the weirdly square shape of Tom Cruise, and the pleasure of Pop-a-Shot (a basketball dunking arcade game). Besides being funny, Vowell is also quite insightful, and she’s a terrific storyteller. One of my favorite essays was about how Al Gore was misquoted in the major news media after an appearance at a New Hampshire high school’s media studies class during the 2000 presidential campaign. After the appearance, when the misquote started appearing everywhere, the students learned more about the media than they probably ever would have from just running their school paper. There’s also a terrific piece, written as a letter to Bill Clinton, about Vowell’s visits to several presidential libraries and what Clinton could learn from these libraries’ successes and mistakes. Most of the political pieces are written prior to 9/11, so the great looming shadow over them is actually the 2000 presidential election and its aftermath. I also loved the essays in which Vowell writes celebrates her geekiness, as she does when she talks about the political e-mail list she participates in and how it’s one of the few places where she can be passionately interested in the trivial details of this one thing and find people who share her passion. As a blogger, I could totally relate to her here. Actually, I could relate to Vowell a lot of the time. She writes about how different she is from her family but how she loves them anyway; she writes about how her parents made her play outside when she’d rather sit in her room reading books all day because she doesn’t like the outdoors that much; and she writes about how she never could figure out how to interact with people until she discovered a shared geeky interest. I get where she’s coming from most of the time, and I do love finding a companion on the page (or the CD, as the case may be). Plus, there are Buffy the Vampire Slayer references. Buffy references always make me smile. The one thing that didn’t work so well was the use of other celebrity voices (Conan O’Brien, Stephen Colbert, Seth Green, and so on) for some of the longer quotes (O’Brien as Lincoln, for example). It just felt a little jarring, and maybe a hair like Vowell was showing off her hip credentials by inviting her hip friends to read from her book. (She may not even know these people, but it seemed a little weird, and unnecessary.) But the musical interludes from They Might Be Giants were fun. Basically, if you enjoy Sarah Vowell on This American Life, you’ll probably enjoy this book. And if you haven’t listened to her on TAL, check out their archive of her stories. There’s more variety in this than there was in Assassination Vacation (the only other Vowell I’ve read). For me, that worked because I like Vowell herself as an essayist. The topic is almost irrelevant. 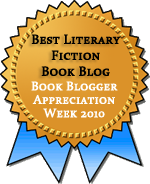 This entry was posted in Audiobooks, History, Memoir, Nonfiction. Bookmark the permalink. I don’t really care much for politics in general, but Buffy reference are always appreciated! It sounds like this could actually be a pretty accessible foray into American politics, and not necessarily dry and humorless as politics so often winds up being. I hadn’t considered reading Vowell’s non-fiction, but it might be an interesting way to vary my reading. It is a good start, Clare, especially because of the variety. My main complaint about O’Brien as Lincoln was that the addition of other voices was always a little jarring, and it wasn’t consistent. Some long quotes were read by someone else, some weren’t. I’m currently listening to Assassination Vacation, which is the first time I’ve listened to one of her books. She’s the perfect narrator for her essays, and I love her little asides, and her almost snarky voice. Jill, I think her voice is perfect for getting across the snarkiness. For some reason, I can’t get the tone right when I read her in print. I’m glad you made the comparison between Sedaris and Vowell. He is also an author that I like much more when listening to him speak rather than reading his pieces. I’ve only listened to Vowell on audiobook so far, and from the sounds of it I’ll be keeping it that way. I’m glad this one was good too — I’ll be looking for it at the library soon. Kim, I’m glad I’m not the only one who feels that way about Sedaris. I first encountered him in print (Me Talk Pretty One Day), and I just didn’t get what the fuss was about. But then I started listening to This American Life and fell in love with his stories. Now I only “read” his work in audiobook form (but I would love to see him live as well). I’d definitely agree. I love both Vowell and Sedaris, but their humor comes through so much better on audio. I went to one of Sedaris’ book readings and it was wonderful. I can definitely see that Vowell’s writing would work better when read aloud rather than when read on the page. But was Vowell herself the reader? I’m not sure about listening to that voice for long stretches of time!